What a year, right? When I look back and reflect, I’m pretty amazed that this all happened because of a bored accountant’s daydreams. In my earlier life as an accountant, I used to look out the window at people sailing on the Albert Park Lake and wonder what kind of a job would allow you the freedom to go sailing on a Wednesday afternoon. I mean, who does that? The best I thought I’d be able to do is use my holiday time to travel to places like Hong Kong, Thailand, Bali or Mexico for a week or two of surfing and eating street food, then it would be back to the daily grind for another stretch until I saved up enough money and vacation time to put on my traveling shoes again. Life changed for me when I saw an ad for an electric wok. Inspired Imade a mobile wok barbecue contraption (somewhat dangerous version 1) and I started having cooking parties. Pretty soon I was a very popular guy — everybody wanted me at their party! I realized there was a potential business here, and I expanded little by little, till here I am, twenty years later with a staff of dozens of people who do hundreds of Flying Wok events every year. We took a simple concept — mobile wok cooking — and we made it into a fun and satisfying business. This Christmas season we’re serving holiday staff party meals to workers at 16 hospitals throughout the greater Melbourne area, and more than ten thousand hospital employees will enjoy our delicious Flying Wok recipes for Shanghai Chicken with Shitake Mushrooms and Udon Noodles, or Rockling Fish Tagine with Cherry Tomatoes, Chickpeas and Chermoule Spices, or any of our other tasty preparations. Whether we’re cooking for an intimate party of a dozen guests or a corporate event involving thousands, we do it all on site, and we make it a memorable affair. We specialize in Thai, Malay, and Chinese stir fry and curries, Moroccan tagines, and Spanish paella, by the way. I quit that accounting job a long time ago, but I got my wish to surf on Wednesdays — I live near the beach in a little town in the Otways with my wife Melissa and my boys Owen and Lenny. We live a simple life, close to the beauty of Nature. We live off the Grid and grow our own vegetables, and I feel very blessed to live here. This is the life that I imagined twenty years ago when I was sitting in that office looking out the window at the boats on Albert Park Lake, although I never thought I’d make it out of my cubicle at the time. I’m grateful to all the fans and customers of Flying Woks for helping me to realize my dream, and I look forward to adding our special touch to your events in the year to come. 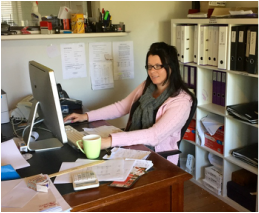 Narelle Johnson is our fantastic Office Manager who answers your calls, liases with clients and staff, just makes everything tick over the way it should. We are blessed to have her doing her magic for 'the woks'. ​Chuong Ngyen is our Kitchen Manager who can also be found out and about on functions. Originally from Da Nang, central Vietnam, he is much loved by staff and customers a like for his warm smile and 'nothing too much trouble" attitude.